Begin by talking to Lakki the delivery dwarf who can be found south of Ice Mountain. Head to Lakki the delivery dwarf who can be found south of Ice Mountain and talk to him. He will explain that one of the crates he is supposed to be delivering to Drorkar's power station, which is powering Nurmof's pickaxe machine, has gone missing and he may lose his job because of it. You will find the Crate by searching the bushes next to the path to the west of Lakki. Once you have the Crate, head to Drorkar in the building west of the Dwarven Mine entrance to the north and talk to him. He will explain all about how dragons' stomachs are some of the most efficient heat production systems in the world and when the young are fed coal they will burn it more efficiently than any furnace with a cut-scene to help you obtain a better understanding. Of course this is highly unethical, but the dragons are the property of the Keldagrim Mining Consortium so animal welfare must be ignored when industrial progress can happen. He will give you a letter written in impenetrable dwarven script which you should take to Brother Bordiss who can be found in the garden in the northern part of the Monastery. Upon attempting to talk to him, you will find out from Brother Althric that he has taken a vow of silence, however upon giving him the letter he will mention Zamorak's fiery hooves and explain that it is a disaster for dwarves and other creatures. 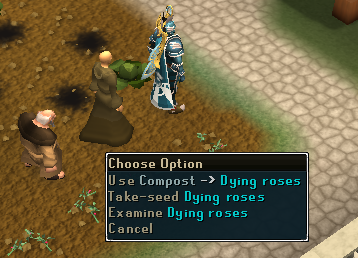 Brother Althric will then notice that his roses are dying because it is too hot for them. To fix this you will need to use both some Compost (or Supercompost) and a Watering Can with some water in on the Dying Roses. The Roses will then grow again, however, as if on cue, a Gnome will parachute in with an urgency to get to the mountain. Brother Althric will give directions and the Gnome will rush off without even saying thanks. 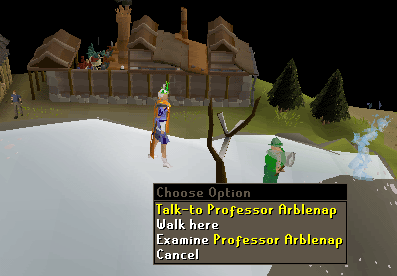 Brother Althric will suggest that you speak with him, so head onto Ice Mountain and talk to Professor Arblenap. He will explain that he is there to collect Baby Icefiends because a Spirit Tree told him that they are at their limit for tolerance of temperature and it is still getting hotter. If he fails to do anything, they will become extinct and since they help keep the world cool it would be a disaster! As all characters you meet during Quests appear to be, he is terrible at doing what he is trying to do - catching the Baby Icefiends. 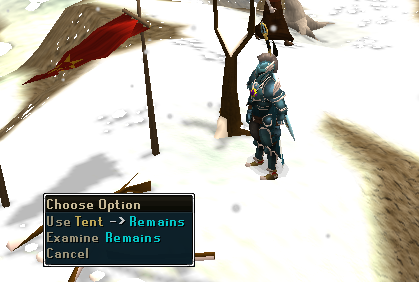 Due to this, he will give you an Icefiend Net and tell you to catch 4 Baby Icefiends which can be found on the mountain. Once you have all 4 Baby Icefiends, talk to him again and there will be a cut-scene in which the ground shakes. He will leave in a gnome pod, then the screen will become white in what appears to be a bad attempt at trying to show an avalanche happening. 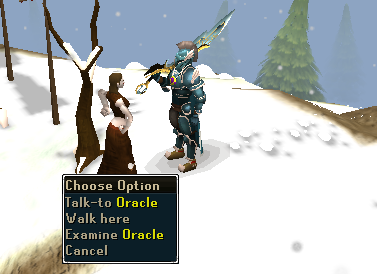 Your character will confirm that this actually happened, so head to the north of Ice Mountain and talk to the Oracle. 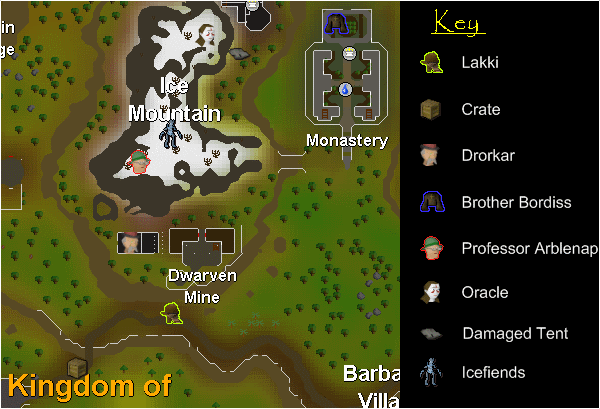 It will become apparent that the Oracle's tent was severely damaged in the avalanche and is now in a broken heap at the bottom of the mountain (next to where the character in Monk Robes is in the above image). Offer to help and you will find out a brand new synonym for kindness in case you had not managed you work it out on your own. Head down the mountain and take the tent. Upon doing this, you will notice that to repair it you will need two wooden planks, two nails, a hammer and a saw. With these items, head back to the Oracle and use the Tent on the Remains to build it where it fall from. Now having a tent to live in, the Oracle will predict a future with no snow, hotter seas, a desert from Varrock to Lumbridge and limited crops that people fight over, eventually making everyone die. 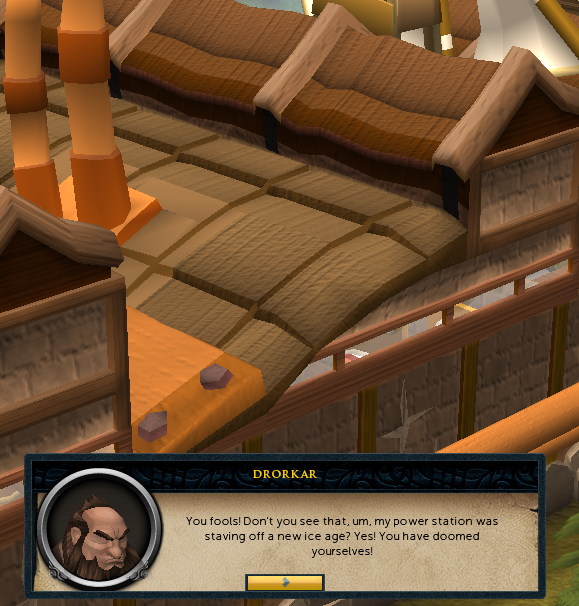 Yes, it's another annoying lecture about how global warming is going to come and kill us all, but since this is RuneScape rather than Real Life™, there is one simple problem - Drorkar's power station - and because you are the hero (or heroine), you must go and stop it because the future can still be decided! 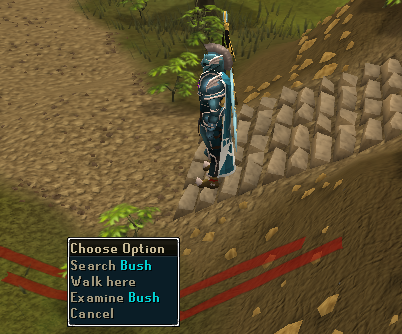 Head into the Dwarven Mines and speak to Nurmof who can be found at number 1 on this map. 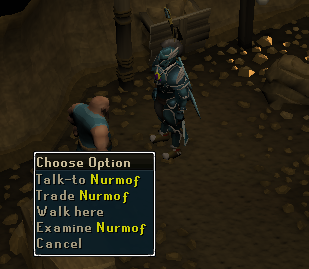 On your way to Nurmof, if you wish to do so, you can take a short detour and pickpocket Drorkar for a key that will be used later in the Quest, although this can be left until later if desired. Tell Nurmof that the power station needs to be shut down to save the world, however he will complain because it would stop his trade and the only other option would be the lower quality Pickaxes that can be bought from Keldagrim. 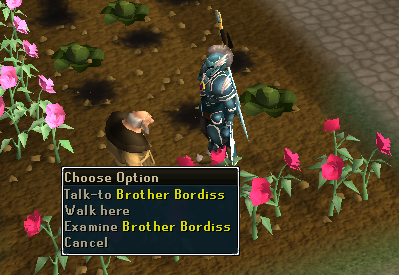 Although this may be the case, Bordiss mentioned an alternate method of power before he left, so head back to the Monastery and speak to Brother Bordiss and mention the other power source. He will break his vow of silence and explain how he left because the day before the meeting, he drank too much alcohol and the Key to the Chest with his plans in was taken. 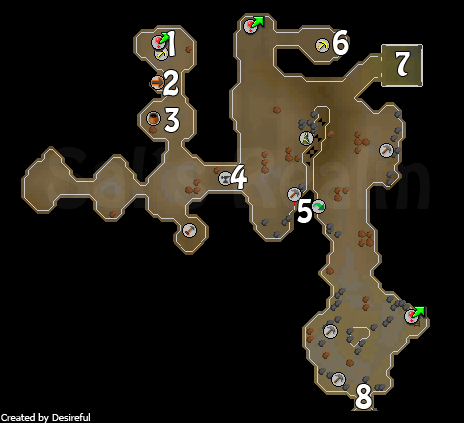 Head back to the Dwarven Mine, taking the detour to pickpocket the Key from Drorkar if you decided not to earlier, and make your way towards Drogo's Mining Emporium at number 6 on this map. On the way in is the chest that you should open to find the Plans which are covered in technical drawings and mathematical equations. Use the Plans with Nurmof and you will view a cut-scene in which the eco-friendly plans are shown. Make your way through the cut-scene in which Drorkar makes a number of statements with no evidence to back himself up and you will complete the Quest! 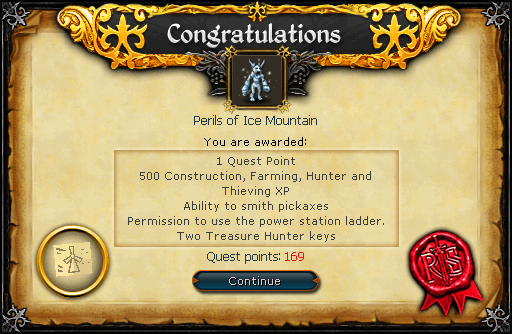 500 Construction experience 500 Farming experience 500 Hunter experience 500 Thieving experience Ability to smith pickaxes, each requiring two Bars of the appropriate metal to make Permission to use the power station ladder.